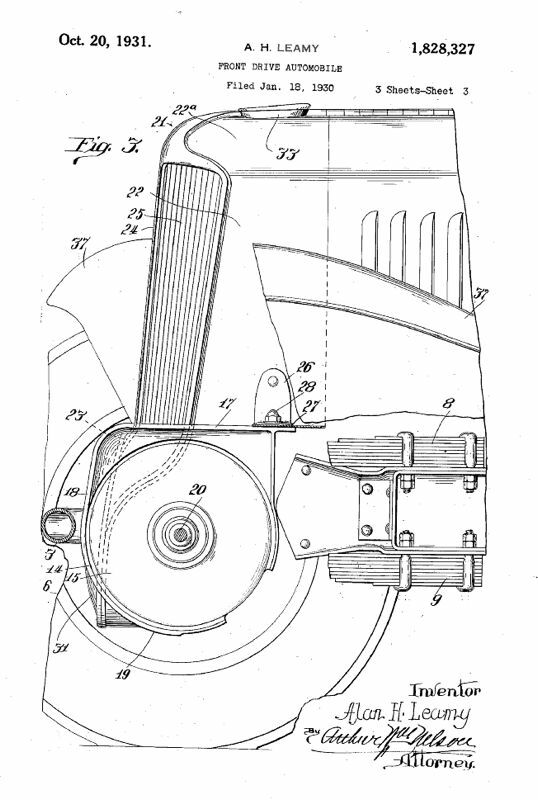 The L-29, introduced in 1929 has a front wheel drive drivetrain with a three-speed transmission that was designed by Auburn chief engineer C.W. Van Ranst and others at the Auburn, Cord, and Duesenberg organizaton. 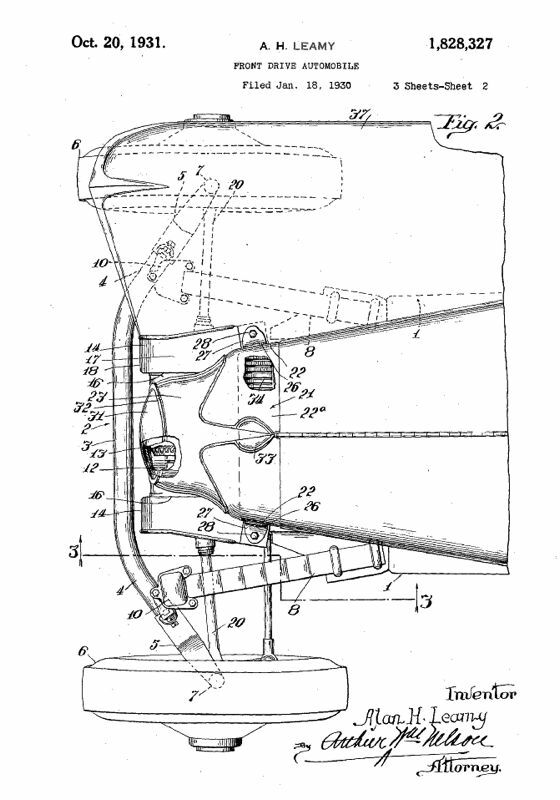 The front axle is loosely based on that of the front wheel drive Miller racing car. A Lycoming L-head 298.6 c.i. straight-eight engine producing 125 h.p. that was also used by Auburn was chosen to power it. 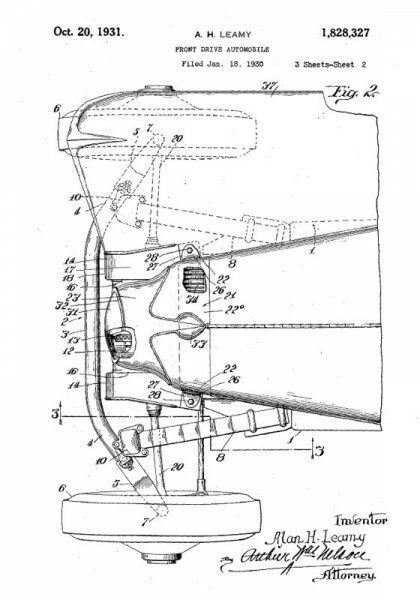 Below are patent drawings filed by Leamy showing styling elements along with the unique front wheel drive layout, and front suspension system. 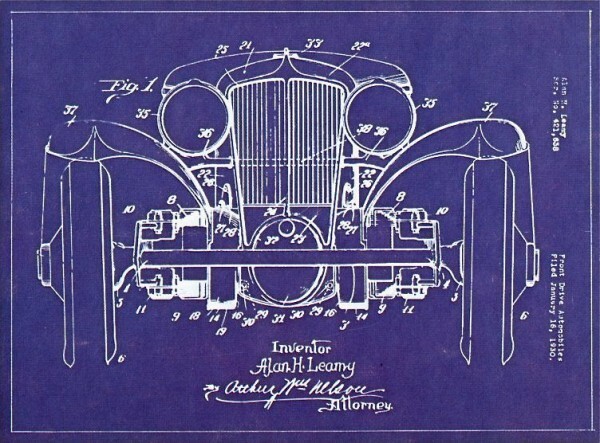 Leamy’s design won a top award at a Concours held in Monte Carlo while it was in production. During the trying times of the Great Depression, the L-29 was produced only between the years of 1929 to ’31, and only a little over five-thousand are reported to have been built. Had the times been different and mechanical flaws the car suffered from quickly corrected, the car and the concept may have gone on to a better fate? The lead photo is courtesy of the Auburn Cord Duesenberg Automobile Museum Archives. Update: In a period New York City area newspaper article (the name of the paper has been lost,) we found a report a few years ago stating that a L-29 Cord received the highest honor ever given to a standard American car in a competition at Monte Carlo. The article goes on to state that a second L-29 with an American custom body designed by Count Alex de Sakhnoffsky also won a Grand Prix that apparently was another name for a Concours type of show. Reader Jerry McDermont also found the photo above of an L-29 Convertible Sedan that was in an advertisement in the June 8, 1929 edition of L’Illustration, a French magazine. F.A. Jomini, a dealer with a showroom located on the stylish Avenue des Champs-Elysees in Paris, France placed the ad telling of his upcoming exhibit at the Paris Auto Salon. This entry was posted in Auto photos 1921 - 1942, Auto Racing 1894 - 1942 and tagged Alan H.Leamy, Auburn, Cord, Duesenberg, L-29 Front Wheel Drive Cord, Lycoming Engine, Monte Carlo Concours, Wade Morton Cord Sales Manager - Racer. Nice double WW tires. What are those two diamonds ? Goodyear logo? That was the logo for the Goodrich Silvertown Cord model tires, they were considered the top of the line tires available during the 1920’s-1930’s and were found on only the most expensive cars available. The driver is very contemporary-looking, with that 3-day growth of beard. Do those Cords have good cornering maneubrabilty as modern front wheel driven car s or its turning radius was bigger…? Of course they didn´t count with the modern homocinetic joints… . 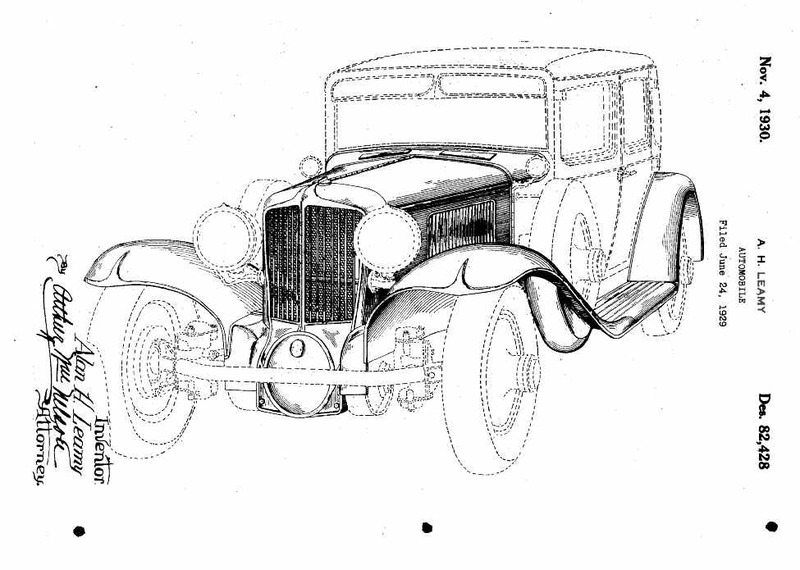 “A turning circle diameter of 42 feet was considered short for a car of its length.” From Don Butler’s book Auburn Cord Duesenberg, page 213, regarding the turning circle of the Cord L-29. Note that most articles do not state whether the distance was measured as a curb-to-curb turning circle or a wall-to-wall turning circle. The curb-to-curb figure means the wheels will turn the car around on a street of that width. The wall-to-wall distance is almost always bigger since the wheelbase is shorter than the total length of the car, the car bodywork needs extra room to complete the turning circle (think of a 1959 Cadillac fin and how far it extends past the rear wheel). I almost wrecked a 1936 front wheel drive Cord of a friend thanks to its awful handling. Under steer, over steer, crash. 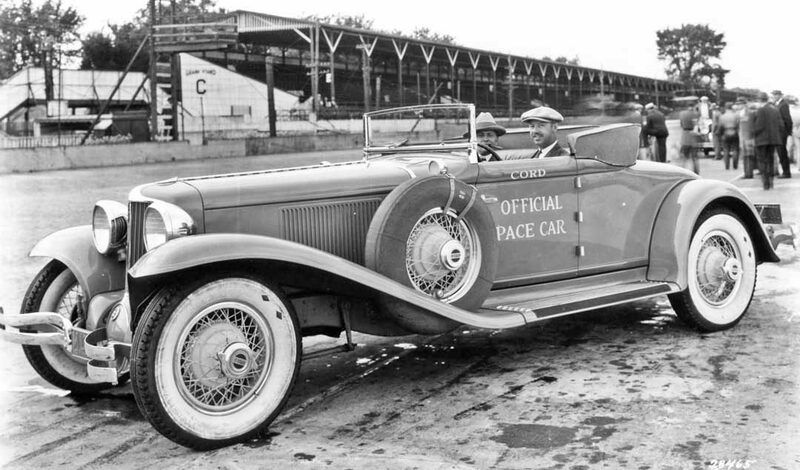 Don Butler in his Auburn Cord Duesenberg book stated the following about this pace car on page 217. The car that won the Monte Carlo concours had a body designed by Count Alexis de Sakhnoffsky, and it sold for $2.4 million in 2012. Details at the link below (replace the two instances of the word “dot” with a period symbol). Butler states that Cords, “won 39 awards at 23 European events, most of the events being French concours,” in a six-month period. Also of interest, a race car based on a mostly Auburn chassis was entered into the Indy 500 that year. The Trexler Special qualified 29th in a field of 38 at 92.97 MPH. After just 47 miles it was involved in a 7-car accident and out of the race. Reader Jerry McDermont found a report in period news paper article and a photo of a L-29 convertible that was going to the upcoming Paris Auto Salon that has been reported to have won an award. Check the update. If memory serves me correctly, the de Sakhnoffsky Cord was a beautiful blue sport coupe with a dramatic dip at the top of the door line. It recently sold at auction for more than $2 million. The body was by Haynes where the Count went to work after coming to America. He kept it for many years and it often displayed at Detroit area car shows in the 1950s. de Sakhnoffsky designed it and paid to have it built to get the Haynes job. I realize it’s a Cord — but it’s a Deusy of a car!